A reminder of what our club does within and as part of our local Tynedale community and beyond. This year our fund raising activities have enabled us to distribute about £13,000, locally and overseas. The Rotary Club of Tynedale Presentation Evening. Great North Air Ambulance to a Young Carers’ Project. In addition to fund raising for our own projects our members give of their time to help at other community events. Across Great Britain and Ireland, clubs often come together to collectively support national initiatives such as Community Emergency Support, which provides assistance to communities following major emergencies or disasters. For example following the recent 2015 Tyne flood Rotary Clubs in this area were able to obtain District and National Rotary funds. For Rotary Club of Tynedale this amounted to nearly £38,000 for flood relief received since March 2016 that was then distributed to flood victims throughout Tynedale. That included individual families but also organisations such as Corbridge Youth Initiative to renew their allotment shed and Ovingham Scout Group, to repair their meeting place. The funds also helped Corbridge Cricket Club and Tennis Club, to make good damage to their facilities. In addition to local causes Rotarians carry out many international programmes and activities all over the world, reaching out to people in need. In many countries, millions die of starvation and from diseases that could be prevented by clean water, proper sanitation or medicines. Other projects include eradication of hunger and malnutrition; reduction of child mortality, disease prevention and education for all. For example the Global Rotary focus at this moment is to End Polio Now, eradicating polio from the last few countries. When natural disasters strike, anywhere in the world, Rotarians are among the first people to take action, organising collections and raising large sums of money for the various charities that are best equipped to provide relief for those in need. 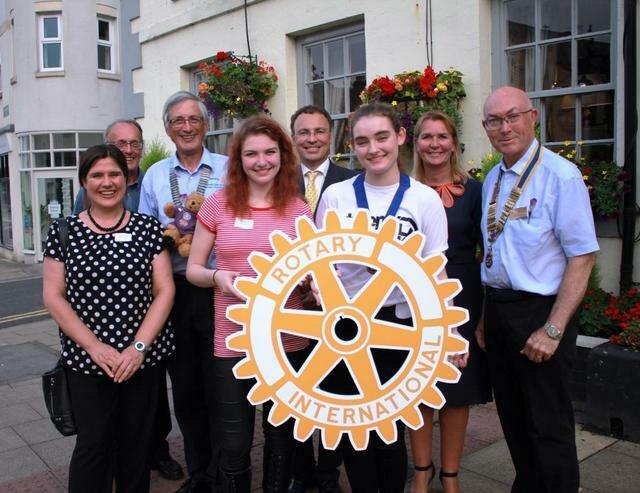 For example we are very proud of a joint project with Hexham Rotary Club to obtain matched funding to replace water supplies to mountain villages in Nepal following recent earthquakes. If you or someone that you know would like to join us to help develop our idea of ‘Service above Self’ in all of our communities please chat with us tonight or visit us as a guest at a meeting. It is an opportunity to meet, work and have a great time with like-minded people. Today Rotary continues to respond to the needs of an ever changing world, whilst retaining its strong founding principle.